Our Very Own Hobbs Farm CSA! As much as we love winter, the cold weather always gets us dreaming of spring and all the super fresh produce and beautiful flowers the growing season will bring to our farm. In fact, one of our dreams of the past several years was for us to grow enough high quality produce that we could one day offer our own CSA. Well, that dream is about to become a reality! We are very excited to announce that this year we will be offering our very first Hobbs Farm CSA! After reviewing the information below, please let us know as soon as possible if you’d like to receive a share of this year’s harvest. There are only 8 shares available. CSA’s are Community Supported Agriculture, essentially a relationship between our farm and you, our customer. Rather than simply purchasing food, you guys become “members” of the farm who receive a portion of our harvest each week, via shares. Shares, because there is a shared risk and reward to being a member via the inherent risks of farming, but also amazing rewards, such as a bounty of beautiful crops in a good season. By purchasing a share, you are agreeing to share the risk of crop failure and the rewards with our farm and the other members. Last year’s crops included kale, chard, broccoli rabe, radishes, turnips, scallions, assorted greens, garlic, herbs, tomatoes, peppers, potatoes, cucumbers, summer squash, husk cherries, assorted berries, carrots, beets, flowers, tomatillos, eggplant, green beans, flowers, winter squash, pumpkins, lettuce, ginger, lemongrass, Jerusalem artichokes, cabbage, and dry beans. Our farmers blew us away with the quality and variety. We can’t wait to see what they can bring to the table with another year of farming our land. – 10% off of beers that you consume here at Throwback Brewery during pickup hours (Wednesday, 4pm-9pm) during the 16-week period. The 10% discount will apply to two people max (e.g., you and one other person). Of course there’s an optional beer add-on! If you want to include farm-fresh beers with your farm-fresh vegetables and flowers, we’ll add them in to your share. With this option, our owners and brewers will hand select two 16-oz cans each week to add to your share. By the end of the 16 weeks, you’ll receive 32 totals cans – a value of $132 for only $120! Okay, I’m In! What Now? 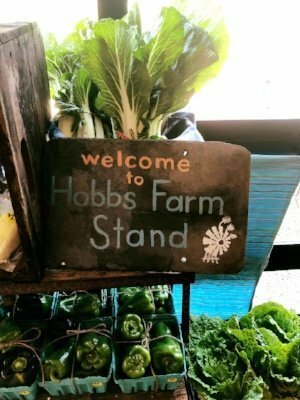 One Hobbs Farm CSA share costs $400 for the 2019 season. This cost represents a 5% discount on produce and flowers, in exchange for supporting the farm. If you’d like a share, please send our farmers an email, and they will get back to you with the details you need to sign up and pay. (We do need upfront payment to successfully run the CSA.). Once you’re a member, pick up dates will be Wednesdays, 4pm-9pm in the brew pub, starting on June 12th. We’re so thrilled to have you join us on our journey, we can’t wait to hear from you!